Zachary Bruck, Vice Chair of our Parish Pastoral Council, offers a PSA about our upcoming Feast Day celebrations toward the end of September. Our festival committee has been hard at work, looking for new and exciting ways to make this year’s celebration even more exciting! Be sure to join us! On Wednesday, September 20th from 9 am – 5 pm and Thursday, the 23rd from 9 am – 7 pm, everyone is invited to the church to spend time with Jesus in Eucharistic Adoration. On Friday the 22nd, Holy Mass will be offered as usual at 8:15 am followed by Exposition of the Most Blessed Sacrament. This will conclude around 5:00 pm before the offering of Holy Mass at 5:30 pm. Following Mass, an authentically crafted pasta dinner will be served in the school gymnasium. Basket raffles will be available throughout the weekend for some wonderful prizes! As the carbs settle in, stay for The Peanuts Movie (2015) to unwind and relax as the weekend begins. On the morning of Saturday the 23rd, we’ll start the day with a walk to raise funds and awareness for the Sacred Heart Clinic. 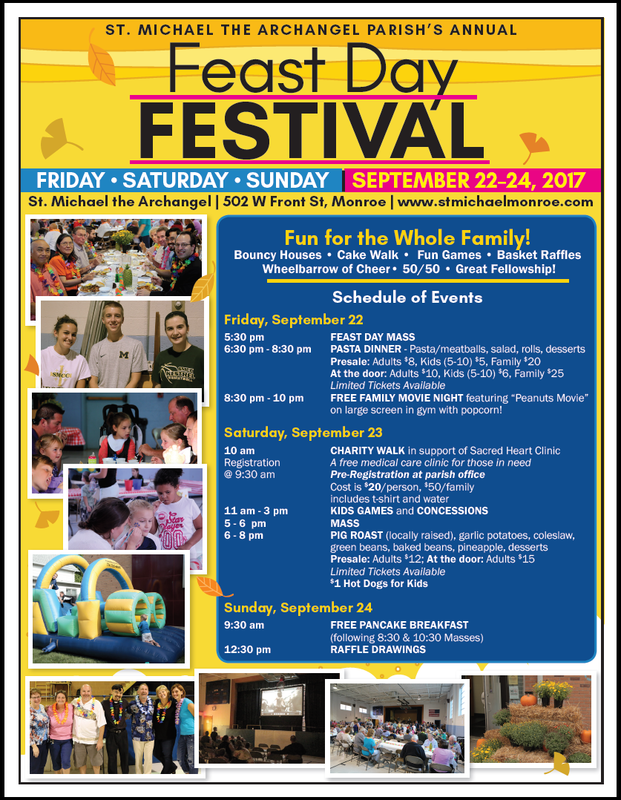 Afterwards, there will be plenty of activities for the whole family: games, a bounce house or two, cake walk, and much more! At the Masses this weekend, I will lead us in renewing our consecration to the Pierced Hearts of Jesus and Mary. The Vigil Mass is still scheduled at 5 pm (confessions at 3:30 pm). After Mass, join us for the pig roast and for some fun. On Sunday the 24th, a hearty pancake breakfast will be served after the 8:30 am and 10:30 am Masses. After the 10:30 am Mass, our raffle drawings will commence. I hope you can join us for some (if not all) of the activities we have planned as we honor the Feast of St. Michael the Archangel! With such an event, we need volunteers to help make this into a great success and graft it once again as a wonderful tradition for the parish. There are a number of volunteer opportunities available from September 22nd through September 24th. Please consider signing up at our board located at the east entrance of church.